"A very easy cornbread recipe that the children and husbands will love. It's sweet, chewy and ready in a jiffy!" Place the muffin mix a large mixing bowl. Stir in the milk and egg. Mix in the cream corn and sugar. Pour batter into prepared pan. Bake in preheated oven for 30 minutes, or until a knife inserted into the center of pan comes out clean. Not at all like traditional cornbread. Very moist and sweet. My husband says its like the cornbread side they serve at Chevy's Fresh Mex. We liked it with honey butter. Not like traditional cornbread. Very moist, and very much like a dessert bread. Still delicious though! I also thought this recipe reminded me of a side dish I get at Rio Bravo....it's YUMMY!!! Very easy and quick. I used a round pie dish and cooked for 35 minutes. Turned out perfect. This is the best! Reminds me of mexican restaurant "corn cake". I have made this recipe 4 times in the last 6 weeks! It's a keeper for sure! Very yummy! My housemates loved it! Reminds us of El Torito Corn cake. 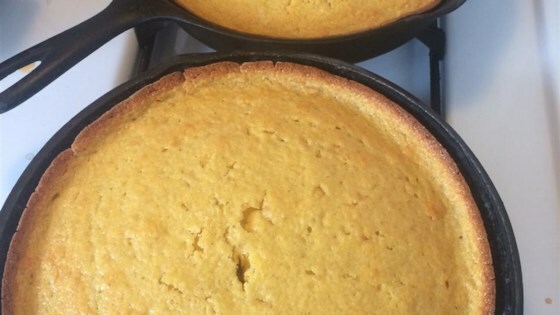 The easiest and most delicious cornbread. I am allergic to eggs, ommitted them, and it was still moist. So sweet! Thank you so much. My mom's coworkers want the recipe.